Michael & Mark met each other in the service department at Noblesville Honda in 2010. In 2013 the dealership closed its doors giving them the added push and motivation to start their very own shop. 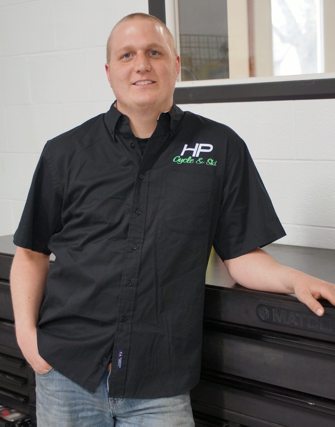 ​On May 3rd, 2014 they proudly opened HP Cycle & Ski. Now here they are: 2 Techs, one Dream. 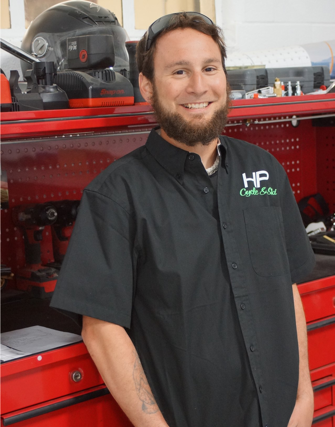 Professionally, I have worked on motorcycles since 2000, starting off at Harley Davidson in Virginia for 7 years with an accelerated training class making my way up to Expert Level Technician. I moved to Indiana in 2006 and started working for Westfield Yamaha & Suzuki for 3 years where I became Bronze & Silver Certified. I went to Noblesville Honda in 2010 and became certified Honda RED which is the highest ranking for Honda. I am very happily married and have two great boys, 10 & 5 who both ride dirt bikes! We ride whenever we can and like to go to motocross races, the Moto-GP, & Indy 500. My family loves anything outdoors from camping to concerts. I have been working on powersport equipment since I was 12 but started professionally when I was 15 at Noblesville Honda Kawasaki. When I was 19 I moved to Florida and worked for Central Florida Powersports, a dealer for Honda, Suzuki, Yamaha, and BRP where I was Head Tech for all manufacturers. It was here I started working on personal watercraft. Noblesville recently asked me back and sent me to Honda training where I became Honda SILVER. This is where I met Michael as the both of us ran the entire service department. In my personal life I love camping & getting the jet skis out on the lake. All around, I love powersports equipment, and living life to the fullest!